Well before the United States entered World War I, the effects of submarine warfare had begun to have a dramatic impact on the shipping and shipbuilding industry in America. By the spring of 1916 the German U-boat campaign had become so effective that ships were being sunk faster than they could be built. Orders to replace these losses quickly filled the slipways of almost every shipyard in the country. While American yards prospered, they could not meet the insatiable demand for merchant shipping. The shortage of merchant shipping throughout the world forced international freight rates to soar so high that it caused serious disruptions in America's overseas trade. In its endeavors to solve the ensuing shipping crisis, President Woodrow Wilson's administration proposed a government program for building certain types of merchant vessels that it claimed would also be suitable for use as naval auxiliaries. Although the administration talked about the need for naval preparedness, its primary interest was trade. Cargo ships would come first; the main task of the government's fleet would not be to support the navy, but to force reductions in overseas shipping rates.1 The administration's efforts to lobby Congress on behalf of business and trade interests were ultimately successful in gaining passage of the Shipping Act of 1916. As will become evident in the chapters that follow, the events surrounding the establishment of the U.S. Shipping Board and the difficulties it experienced while trying to expedite the construction of urgently needed merchant shipping were to have a profound effect on the navy's future attitude toward merchant shipping and its future plans for war. including authorization to form a subsidiary corporation owned by the government for the "purchase, construction, equipment, lease, charter, maintenance, and operation of merchant vessels in the commerce of the United States." Although passed as an "emergency measure," the Shipping Act of 1916 would dictate the course of the American merchant marine and the shipbuilding industry in the United States for nearly two decades. of more shipping. Inherent in this approach was the need to develop standard designs that could be easily duplicated in each yard. Neither man would yield to the ideas of the other, however, so that contracts for the urgently needed ships were held in abeyance even though standard designs had been completed and plans submitted by industry to construct two huge shipyards that would be capable of producing four hundred ships within eighteen to twenty months after groundbreaking. Speed was important if the new ships were to have any impact on the conduct of the war, yet the imbroglio that surrounded the Denman-Goethals controversy held up the timely enactment of the contracts needed for the new yards. After several months of argument that grew into open hostility, President Wilson was finally forced to ask both men to resign, but the damage had already been done; construction of the new yards was delayed until September when contracts were finally signed for four new yards with a total of ninety-six ways.6 The lag in signing these agreements pushed erection of the new shipways well into the winter (one of the coldest on record), greatly slowing the shipbuilding process so that few ships were completed before the armistice went into effect on 11 November 1918.
also taken over six large oil tankers and was in the process of acquiring twenty-nine "Lakers," which were to be fitted out as mine carriers for the huge mine barrier planned for the North Sea. By this time it was becoming more and more apparent that the navy would have to take charge of most of the country's merchant shipping in order to provide the centralized control necessary to insure that these ships would be used to best advantage. Though the U.S. Shipping Board was disinclined to call upon the navy to man the ships under its control, it was soon compelled to do so. Lt. R. T. Merrill, assistant supervisor of naval auxiliaries in charge of the port of New York, came up with a plan for manning merchant ships with naval crews, which he submitted to the chief of naval operations, Adm. William S. Benson. Approved on 9 January 1918, it authorized the establishment of the Naval Overseas Transportation Service (NOTS), to be composed of seventy-three merchant vessels. Cdr. Charles Belknap, then in charge of navy cargo ships, was appointed director of the new organization thereby giving him responsibility for all auxiliary vessels not otherwise assigned to the fleet or the various naval districts. All four of the U.S. Navy's oilers then in commission--Arethusa, Kanawha, Maumee, and the newly completed Cuyama--were included in the ships allocated to NOTS. In the spring of 1918 the first of the ships built by the Emergency Fleet Corporation were starting to come down the ways. American soldiers were being ferried across the ocean at the rate of 250,000 a month by the end of June and the U.S. Shipping Board had delivered over one million deadweight tons of new shipping, about 190 ships.8The success and efficiency of the Naval Overseas Transportation Service was so apparent that both the army and the shipping board asked the navy to man most of these vessels. 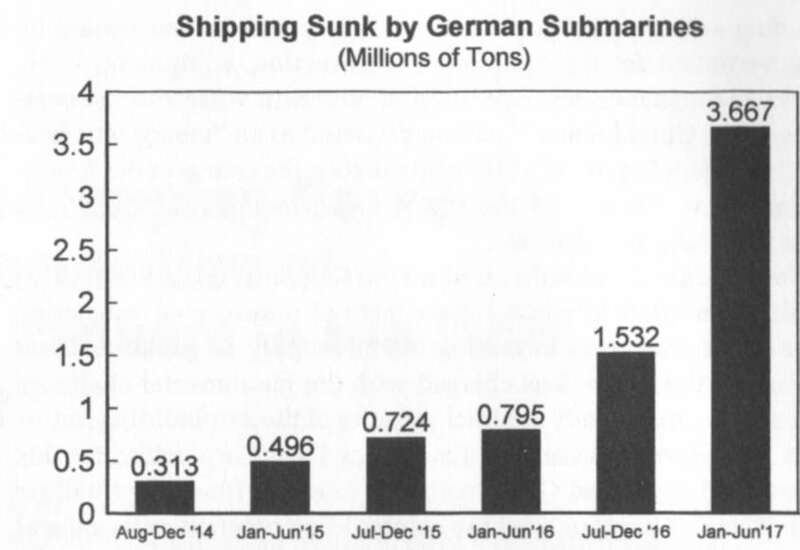 Before the year was out, 533 ships would be delivered by the shipping board. Most would be allocated to the NOTS fleet, which would swell to 450 ships by the time the armistice took effect (another 100 were also in the process of being taken over). The navy's experience with merchant shipping procured by the shipping board was not a particularly happy one. One of the first problems concerned the alterations needed to convert these vessels for naval service. Guns, magazines, fire-control equipment, and other gear needed to be added before the vessels could be placed in service. Most troublesome were the changes needed to accommodate the much larger naval crews to be embarked. This usually meant tearing out bulkheads and wooden partitions that formed the staterooms in which the merchant crews were generally berthed so the entire space could be used for standees and hammocks. Even these alterations were not always sufficient to accommodate the entire crew, however, and it was sometimes necessary to use the cargo space on the main deck underneath the bridge, usually referred to as the "bridge enclosure." This brought a storm of protest from the shipping board, which claimed that the navy was reducing the cargo-carrying capacity of its vessels. They never seemed to understand that to man a ship according to U.S. Navy standards, with gun crews, extra radiomen, lookouts, and so on, required more men than a merchant ship in time of peace. Additional space was needed for more officer quarters, a supply office, storerooms, a pharmacist mate's office and sickbay, not to mention magazines and storage for pyrotechnics, which had to be arranged for safety and accessibility. vessels to sea. As for ships still under construction for the shipping board, the required changes could usually be made with little additional cost or loss of time, but it took a long time and many interviews between the Department of the Navy and the shipping board before a satisfactory arrangement could be made by the builder allowing the ships to be delivered to the navy. Even then the Hog Island plant (one of the huge new yards set up to mass-produce fabricated ships) consistently refused to change its plans of construction although not one of these ships could be operated by the navy as originally designed. Other problems abounded: construction was faulty, steering gear not designed to withstand the hard usage of zigzagging frequently failed, few ships had adequate spare parts, distillation equipment or evaporators were needed, ice machines had to be installed in separate compartments, and so on.9 Though most of these shortcomings were eventually corrected, the navy would take heed of this experience in the coming years, pushing for legislation that guaranteed that the design for any merchant ship financed with government aid would be approved by the Department of the Navy. located to date. Although the shipping board had adopted a standard tanker design for its own use, orders were placed on the builders for ships of their own design. just out of range with well-placed shots, and laying six smoke pots that hid her from the enemy for some twenty minutes. The U-boat soon passed to the weather side of the smoke and renewed the action peppering the George G. Henry with shrapnel, which wounded fourteen men. Despite the flames and dense, acrid smoke, the engine room force remained at their posts throughout the action so that the ship's speed could be maintained. At 1015, the after deck gun was brought to bear allowing the gun crew to open fire with the last of the ammunition. Discouraged by the renewed shooting, U-152 gave up the chase as the tanker hastened away at 13 knots. Having escaped one danger, the George G. Henry encountered another before reaching New York. Shortly after midnight on 3 October 1918 about 110 miles east of Cape Sable, she made an emergency turn to avoid an oncoming convoy. Before she could swerve to safety, a red light and mast headlight came close under her port bow and the tanker cut into the NOTS's collier, the Herman Frasch, forward of the poop deck and below the water line. Within minutes the collier had sunk beneath the waves. The tanker quickly lowered life rafts and boats and swept the sea with her searchlights looking for survivors. By dawn sixty-five members of the ill-fated collier's crew had been hauled from the sea to safety. After repairs in New York, George G. Henry made three more voyages for the navy until May 1919 when she was decommissioned and returned to her owners. Over the next two decades the venerable merchantman plied the monotonous trade routes of the Atlantic and Pacific unaware that she would put on war paint once more before winding up at the breakers. Not all the tankers assigned to NOTS were as lucky as the George G. Henry. In May, one of the largest ships in the NOTS fleet, the 15,000-ton oil tanker William D. Rockefeller, was torpedoed and sunk. Owned by the Standard Oil Company, she had been taken into the navy on 8 October 1917 and was one of the first vessels given over to the new command. 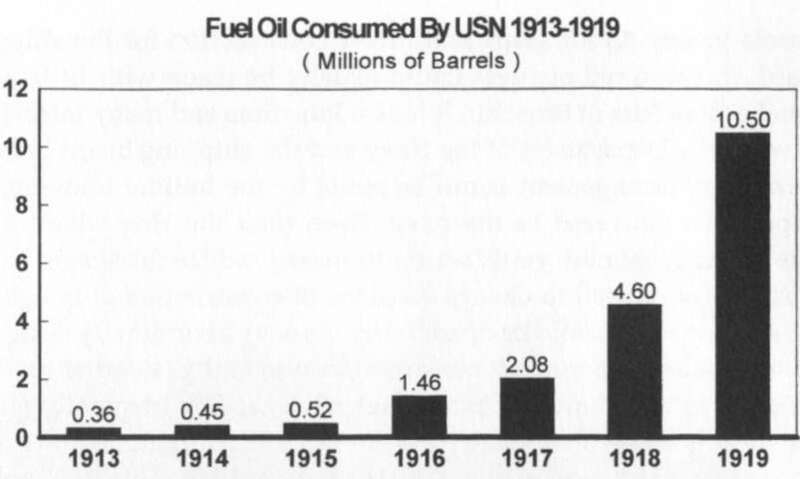 When contracts were issued in the early fall of 1918 for the twelve new tankers ordered by the U.S. Shipping Board for the U.S. Navy, it still looked as if the war would continue for another year. Orders for eight of the ships were placed with Newport News, although fabrication did not begin until mid-December 1918 when the keel for the first vessel, hull number 248, was laid.14 Despite the heavy volume of other work in the yard, Patoka, the lead ship, was launched on 26 July 1919. Displacing 16,500 tons on an overall length of 477 feet, she was typical of the commercial tankers then being built in the United States. Like the majority of these ships, the Patoka was a single-screw vessel powered by a reciprocating steam engine of the quadruple expansion type. Rated at 2,900 s.h.p., this machinery enabled the ship to cruise at 10.5 knots, a respectable speed for a commercial vessel of her day, but significantly less than that of the Kanawha-class oilers built and building (three more were under construction at the Boston Navy Yard).15 After completion and trials, the Patoka was delivered to the shipping board on 3 September and transferred to the navy the very same day. She was commissioned in October and immediately placed into service with NOTS. years before all seven were taken into the navy. The last to be delivered, the Tippecanoe, was not officially transferred to the navy until 1922. No longer needed for active service, she was laid up "in ordinary" where she remained until 1940 when the threat of war and the urgent need for more oilers led the navy to place her in service for the first time, twenty years after being laid down! Orders for four more navy tankers were placed with the Cramp yard by the shipping board. The Alameda was the first to be completed. At 466 feet, she was somewhat smaller than the Patoka, though the two classes were similar in most other respects. Commissioned just four days after the Patoka on 17 October 1919, the Alameda was also assigned to NOTS. 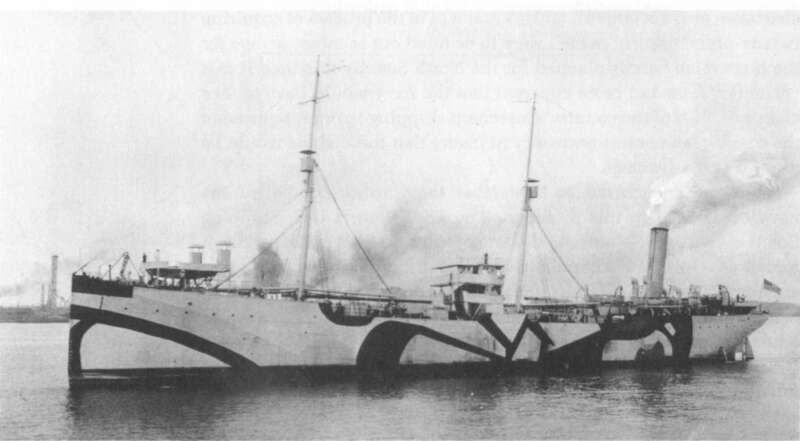 Only two of her three sisters, the Kaweah and the Laramie, were placed in service during the interwar period; Mattole, the last to be acquired, suffered the same fate as the Tippecanoe, not being commissioned until 1940. Merchantmen continued to be commissioned and assigned to NOTS for weeks after the armistice was signed and the number of ships in the NOTS fleet did not peak until January 1919. At this point the U.S. Navy was operating nineteen merchant tankers in addition to the four deployed navy ships. The navy dismantled the NOTS fleet as operations in European waters began to subside. Although the Department of the Navy continued to receive newly launched ships from the shipping board, unneeded vessels were quickly decommissioned and returned to their original owners or back to the shipping board--in some cases within weeks of commissioning. After the end of World War I, all ships in the Patoka and Alameda classes were officially transferred from the shipping board to the navy's account.16 The navy also retained title to two small tankships that it had acquired in 1918. These were the Sara Thompson and the Robert L. Barnes. The Sara Thompson, launched in 1888 as the Gut Heil, was one of the very first ships designed from the keel up to carry oil in bulk. 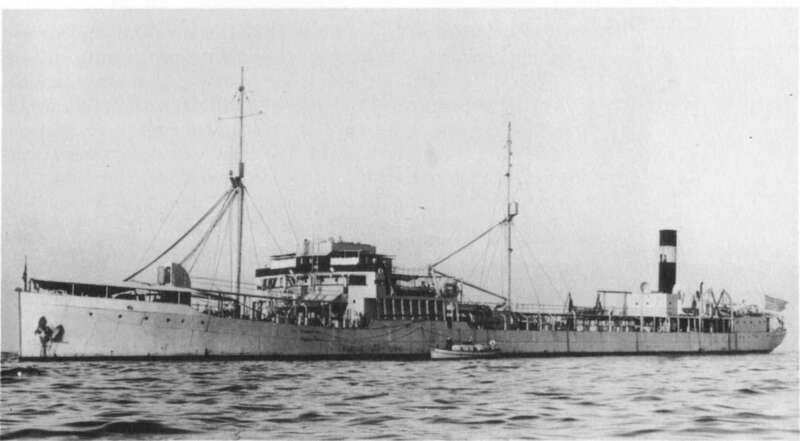 Designated AO-8 in 1920, shortly thereafter she was placed in ordinary lay up at Cavite Navy Yard, Philippines, where she served as a floating storage vessel until redesignated as a receiving ship in January 1930.17 The Robert L. Barnes, AO-14, also served in the Far East, most of the time as an oil-storage vessel in Apra Harbor, Guam, where she could still be found when the Japanese attacked on 8 December 1941.18 Bombed and strafed at her mooring, she fell into enemy hands when the Japanese invasion force landed on the island.